Advocate of Great Independent, DIY, Underground, and Avant-Garde Entertainment Worldwide. S.O.U.L. 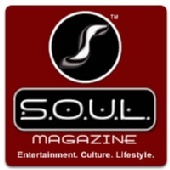 Magazine is the definitive voice of the urban-alternative experience reaching out to people all around the world. The publication is poised to become the leader in reporting entertainment, fashion, and political features for a multicultural audience online. S.O.U.L. Magazine's journalistic integrity, and cutting edge world views make it the primary choice among trendsetters in small and large cities in the U.S. and abroad.